Online tickets sales have closed. Tickets may be available at the event. Announcing the winner of the BENCHS 50th Anniversary logo contest! Let's give Liz Madsen, from Mankato, a big round of applause! Liz designed her simple, yet elegant logo to express thanks to BENCHS for serving the community for the last 50 years. Congratulations, Liz! ​Stay tuned for more information! WINE & BEER TASTING - We are currently collecting donations for our silent auction. Large or small, we can use it! See the event page for details. Also check out our various lists on Amazon. Here is a link to our urgent needs list. DOG WALKERS - The public is invited to walk the dogs at BENCHS every Monday, Tuesday, and Wednesday from 3:30 pm - 6:00 pm. First time walkers need to complete an orientation at 3:15 pm on their first day. See the volunteer page for more information. CONCESSION STAND WORKERS - BENCHS has committed to providing 60 volunteers to run a concession stand at the 2019 Minnesota Air Spectacular in June. See the link on the events page. 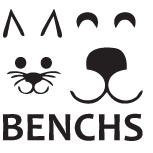 Or email dogs@benchs.org or cats@benchs.org to schedule an appointment at other times.